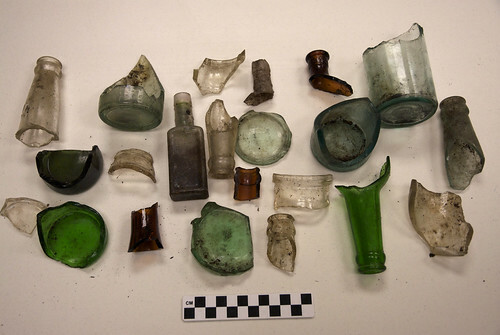 One of my pet interests in archaeology is utilized glass, that is, glass that has been repurposed for cutting or scraping. One of the best examples of this are the glass points of Ishi, a collection that I studied and wrote up during my first year of grad school. 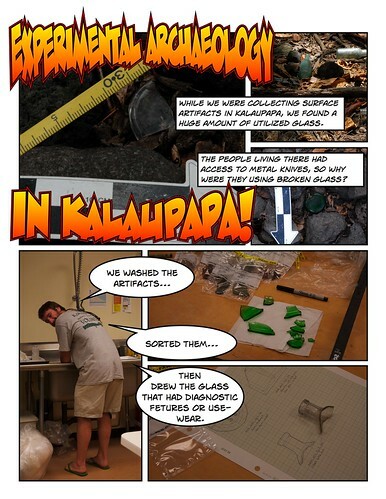 Since then I haven’t worked much with utilized glass, so it came as a lovely surprise to find so much of it at Kalaupapa. James and I planned and collected a large scatter that came up as at least 50% utilized after we looked at it in the lab. We washed all the glass, then sorted and drew pieces that were either utilized or had identifying marks on them. 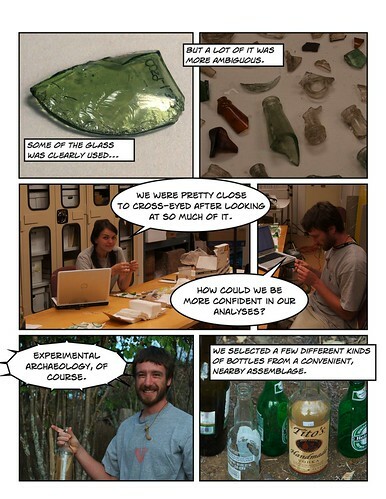 A lot of the glass looked really modern, as in, about 100 years old or so. 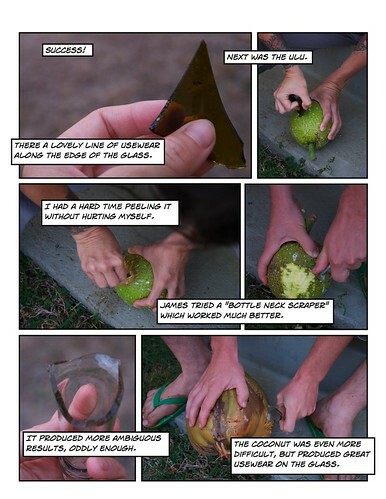 You can figure out a bottle’s age by color and by morphology, particularly by how the bottle’s neck and base were fixed to the body. If you’d like to find out more about how to do this, one of the best references is the Parks Canada Glass Glossary, available here. But we going “chicken blind” (as my darling Serbian friend Marina would term it) and we were starting to doubt our analyses. 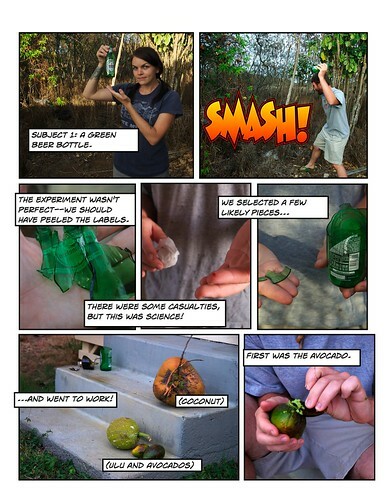 So we did a little experimental archaeology. Dude you are *such* a nerd. Ruth – in all her many guises – will be very proud of you. That is sooooo cool. Even if you reached no conclusions, out of some old-fashioned (pre television documentary) obsession with the truth. Maybe you should have tried combining glass and some fabric, so you could protect your hands from harm? Just asking, but did you factor in the “washing machine effect” of the ocean on the glass and the rocks and sand – to be a possible factor in the evidence of “use wear”? Tumbling stones and glass turns them into many useful items, and even pieces of art. Aloha. 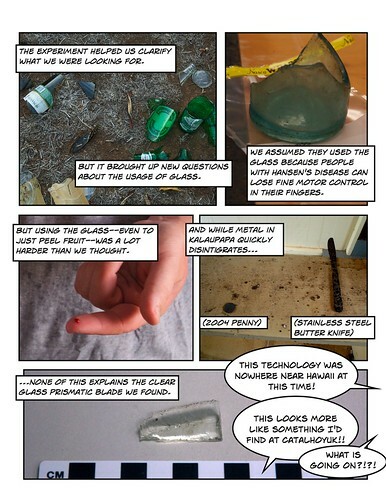 All of the glass that we found were from secure contexts, underground, at least a mile from the ocean. And there was no evidence of sea scouring. Thank you for your question.